Fuel oil hose is made of synthetic rubber with oil resistance, high tensile synthetic yarn braided or spiral and high tensile braided of fibers. It is designed to convey oil, fuel, gasoline and other mining oil. 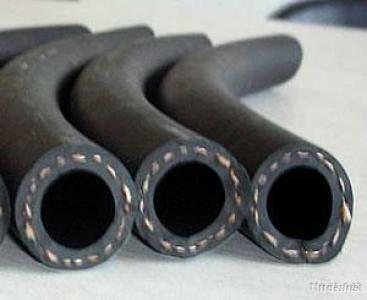 The fuel oil hose consists of three layers, it is inner layers, reinforcement layer and outer layer. The inner layer as the media to convey directly oil is made of SBR or NBR synthetic rubber with oil resistance to improve the convey efficiency. The reinforcement layer is made of high tensile synthetic yarn or fiber braided. It plays a role of standing the pressure. The outer layer is made of SBR or NBR rubber which resists aging, good flexibility, excellent bending. Inner tube: black, smooth, SBR, NBR synthetic rubber with oil resistance. Reinforcement: high tensile synthetic yarn braided or spiraled, high tensile braid of fibers. Outer cover: black, smooth SBR or NBR synthetic rubber, with abrasion, weather and oil mist resistant. Temp Range: -40°C to 110°C. Standard length: 30m, 50m, 100m. Packing: PVC film or weaving bags. Characteristics: smooth surface, resist abrasion, aging, weather, high pressure, lightweight, especially oil resistant, good flexibility, easy to install. Application: The fuel oil hose is ideal for conveying kerosene, gasoline, diesel, engine oil, gasoline, lubricating oil and other mineral oil.